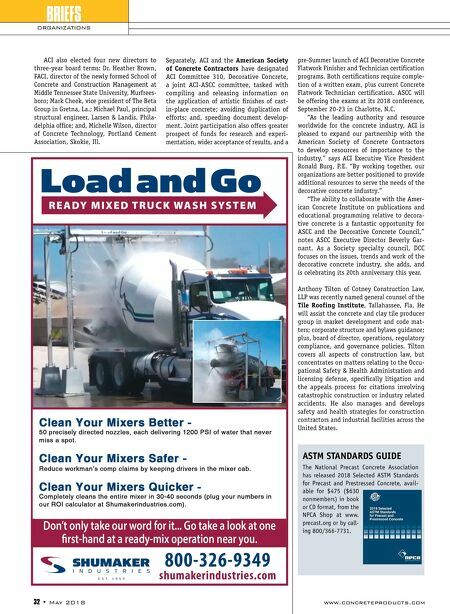 www.concreteproducts.com May 2018 • 33 MANUFACTURERS Fly ash processor and marketer Charah LLC, Louisville, Ky., has secured an exclusive agree- ment covering coal combustion products from the Consumers Energy J.H. Campbell complex in West Olive, Mich. 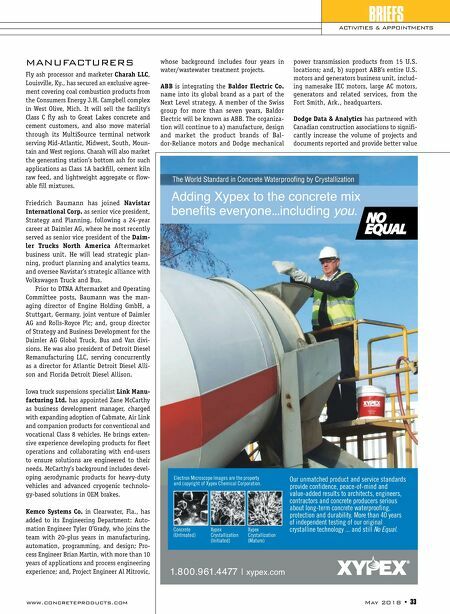 It will sell the facility's Class C fly ash to Great Lakes concrete and cement customers, and also move material through its MultiSource terminal network serving Mid-Atlantic, Midwest, South, Moun- tain and West regions. Charah will also market the generating station's bottom ash for such applications as Class 1A backfill, cement kiln raw feed, and lightweight aggregate or flow- able fill mixtures. Friedrich Baumann has joined Navistar International Corp. as senior vice president, Strategy and Planning, following a 24-year career at Daimler AG, where he most recently served as senior vice president of the Daim- ler Trucks North America Aftermarket business unit. He will lead strategic plan- ning, product planning and analytics teams, and oversee Navistar's strategic alliance with Volkswagen Truck and Bus. Prior to DTNA Aftermarket and Operating Committee posts, Baumann was the man- aging director of Engine Holding GmbH, a Stuttgart, Germany, joint venture of Daimler AG and Rolls-Royce Plc; and, group director of Strategy and Business Development for the Daimler AG Global Truck, Bus and Van divi- sions. He was also president of Detroit Diesel Remanufacturing LLC, serving concurrently as a director for Atlantic Detroit Diesel Alli- son and Florida Detroit Diesel Allison. Iowa truck suspensions specialist Link Manu- facturing Ltd. has appointed Zane McCarthy as business development manager, charged with expanding adoption of Cabmate, Air Link and companion products for conventional and vocational Class 8 vehicles. He brings exten- sive experience developing products for fleet operations and collaborating with end-users to ensure solutions are engineered to their needs. McCarthy's background includes devel - oping aerodynamic products for heavy-duty vehicles and advanced cryogenic technolo- gy-based solutions in OEM brakes. Kemco Systems Co. in Clearwater, Fla., has added to its Engineering Department: Auto- mation Engineer Tyler O'Grady, who joins the team with 20-plus years in manufacturing, automation, programming, and design; Pro- cess Engineer Brian Martin, with more than 10 years of applications and process engineering experience; and, Project Engineer Al Mitrovic, whose background includes four years in water/wastewater treatment projects. ABB is integrating the Baldor Electric Co. name into its global brand as a part of the Next Level strategy. A member of the Swiss group for more than seven years, Baldor Electric will be known as ABB. The organiza- tion will continue to a) manufacture, design and market the product brands of Bal- dor-Reliance motors and Dodge mechanical power transmission products from 15 U.S. locations; and, b) support ABB's entire U.S. motors and generators business unit, includ- ing namesake IEC motors, large AC motors, generators and related services, from the Fort Smith, Ark., headquarters. Dodge Data & Analytics has partnered with Canadian construction associations to signifi- cantly increase the volume of projects and documents reported and provide better value BRIEFS ACTIVITIES & APPOINTMENTS NO EQU A L Our unmatched product and service standards provide confidence, peace-of-mind and value-added results to architects, engineers, contractors and concrete producers serious about long-term concrete waterproofing, protection and durability. More than 40 years of independent testing of our original crystalline technology ... and still No Equal. 1.800.961.4477 | xypex.com Adding Xypex to the concrete mix benefits everyone...including you. The World Standard in Concrete Waterproofing by Crystallization Concrete (Untreated) Xypex Crystallization (Initiated) Xypex Crystallization (Mature) Electron Microscope Images are the property and copyright of Xypex Chemical Corporation.